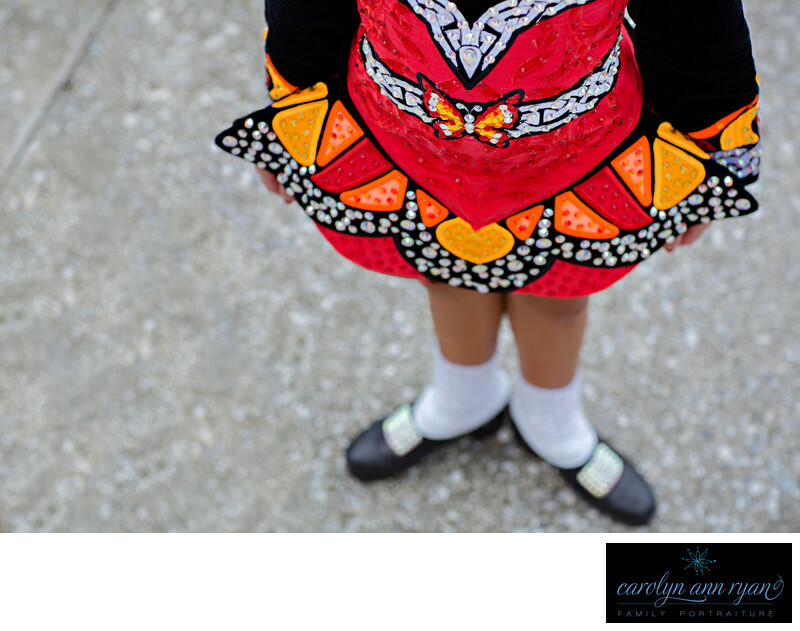 This gorgeous red, gold and black custom made Gavin Irish Dance costume is this dancer's second Butterfly themed costume. This costume holds a special place in the hearts of the dancer, her mom and many more that know her, because the butterflies will always remind the dancer of a dear friend that lost her battle to cancer at a very young age. This young irish dancer wears her butterfly costumes with great pride in remembrance of her friend. I loved this design for this year's competitions. The dress itself just looks like a butterfly's wings and pops on stage. And just like a butterfly, this little dancer flies through the air with grace poise. I will be looking forward to seeing this Irish Dancer compete at the 2019 World Irish Dancing Championships in Greensboro, NC this April. Keywords: bling (18), buckles (3), butterfly (3), butterfly irish dance dress (3), custom dress (6), feis (27), feiseanna (21), Gavin (9), gold (6), Hard Shoe (12), hornpipe (27), irish dance (39), Irish Dance competition (12), irish dance costume (24), irish dance dress (27), Irish Dance Feis (12), Irish Dance holds (9), Irish Dance Photographer (18), irish dance photography (39), irish dance photos (39), Irish Dance Portrait (12), Irish Dance Portraiture (12), Irish Dancer Portrait (15), Jigs (12), red (51), Reels (12), Soft Shoe (12), sparkle (9), sparkle and shine (3), treble jig (33). 1/640; f/3.5; ISO 100; 85.0 mm.